Starting right now, you can search, browse and explore all of the panoramas that are available on the GigaPan sharing site. Dive into the panoramas to explore for yourself, or explore other users' snapshots to see what others have found. As soon as you create your free user account, you can not only explore, but you can also annotate and share your discoveries by creating new snapshots and describing what you have found. This is a way to take part in the GigaPan community even if you have not done panoramic photography yet. We are beta-testing prototypes of the Gigapan robotic mount, which attaches to your small digital camera to create a fast and easy-to-use high-resolution panorama capture device. We are growing the beta process and are negotiating concerning general release and sales of the Gigapan camera. You will be able to purchase these low-cost robotic mounts and take several hundred or thousand images at a time to create panoramas with one billion pixels and more. You don't need specialized GigaPan hardware to take your own panoramas. If you have lots of patience, a high-quality digital camera, and a good tripod (or very steady hand!) you can take hundreds or thousands of overlapping, zoomed-in pictures for a gigapixel-scale panorama, then use off-the-shelf stitching software to combine the images into one very high-resolution panorama for upload. Once you create your free account, you can download our free upload tool to enable you to take any panoramic, high-resolution image and add it to the GigaPan sharing site for community exploration, annotation, and discovery. In Gigapan, you can use the toolbar on the left to pan the view you like. then you can share it to your friends. Panoramic view able to let user experience the real scene and environment than a normal static images. 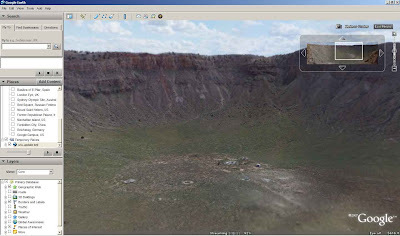 You can add Gigapan service on Google Earth too. Here is what I read and try out! 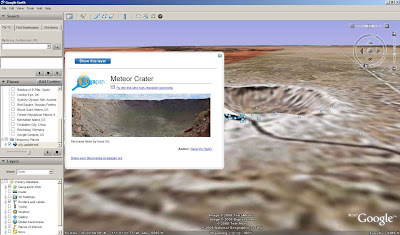 Below is the example of Meteor Crater, Let's click on the link below the title. You will be zoomed to the point and you can take a look how large the crater and environment around the crater! Use the pan tool on the right top or drag the box on the top right to pan around!